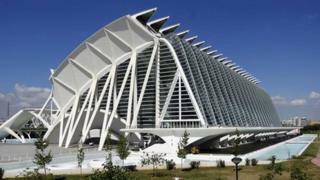 Three years ago the mayor of Alcorcon embarked on a hugely ambitious project. Some 100m euros ($124m; £80m) was to be invested in a world-beating culture and arts centre, complete with nine buildings, three underground levels, and even a circus. But it did not work out. The area where the project was being built is now a sorry sight. Inside, light fittings hang loose and the half-finished futuristic buildings are surrounded by a graffiti-covered corrugated iron fence. A project that was meant to put the local area on the map has instead become an unsightly symbol of Spain's past unhealthy habit of regional overspending. Many regions in the country owe billions of euros, partly because some local politicians built anything from airports to swimming pools to cultural projects during the boom times. Some of those projects now lie unfinished, empty or inactive. Others were completed as planned. But most of them have one thing in common: they have left big holes in local public finances. Take Valencia's City of Arts and Sciences, which was opened back in 1998. The cultural initiative was finished, it is fully operating and very impressive. But its budget deficit is still some 600m euros, with local media claiming that costs doubled to almost 1.3bn euros. Alcorcon, on the outskirts of Madrid, had a change of mayor a year ago. An airport in Ciudad Real, for what? David Perez Garcia is the new man in charge of the city, where some 180,000 people live. He says legal fees and out-of-control costs have pushed the final price of the culture and arts centre to perhaps as much as 170m euros. "It has eaten up all the town's resources," he says, pointing to how the city has been left with 612m euros of debts. "Even the electricity bills aren't being paid. All the money has been sacrificed to this building." According to Llatzer Moix, author of Miracle architecture, the success of Bilbao's Guggenheim Museum in the Basque Country, which attracts nearly a million visitors every year, gave other Spanish cities "cultural envy". There was a mentality of "my neighbour has that wonderful new facility so I want another one like theirs, or probably even a better one", he says. As well as large cultural projects, Spain's transport infrastructure grew exponentially during the boom years. Work on a new airport, costing 150m euros in the autonomous community of Valencia in the east of Spain, finished in March last year. But not a single plane has landed on its runway. In the city of Ciudad Real, a short train journey south of Madrid, another expensive airport lies empty. "An airport in Ciudad Real, for what?" says Celestino Suero from CE Consulting, a nationwide Spanish consultancy firm. "No-one uses it." Failing projects should simply be closed down, Mr Suero insists, calling for more central government control over Spanish regions' finances. "Spain has become a country in which every region does what it wants," he says. "Spain's problems will not be solved unless its autonomous communities are properly regulated." A rise in Spain's budget deficit for this year, to 8.9% of GDP from 8.5% a year earlier, has been attributed to the indebted regions. As a result, the central government in Madrid has set a tough 1.5% budget deficit target for all of the autonomous communities for this year. The government has also said it will provide cheap loans for regional governments so they can pay off their debts. The hope is that this will help mollify the European Commission, which earlier this week said it was ready to postpone Spain's 3% of GDP budget deficit target from 2013 to 2014 - though on the condition that the Spanish regions also get their public finances in order. Much of the debt held by Spain's regional governments is owed to small, local businesses, which carried out work for local authorities and have still not been paid. Enrique Martin, owns Distripaper, a printing and public relations company in Alcorcon. The former administration at the town hall owed him 80,000 euros for work on a marketing campaign that he carried out on their behalf. Because he was not paid, he had to let five of his 11 employees go. He believes the idea of building a multimillion euro cultural centre in the town was flawed from the very beginning. "It was too big for a town like ours," he says. "The cost was far too high."